//Sub/Corpus Blog: This service needs to go mobile ... now !!! So, you are riding your bike, wind in your face, probably enjoying the ride rather than being stuck in traffic. Suddenly, you feel that your bike is becoming a bit hard to maneuver and it starts to wobble. You dread to think, what are the odds of getting a … and bam, realization hits, you have got a flat! Every rider's nightmare. As lucky as you are, your luck is going to run out sooner or later. Mostly, Moore's law plays out really well in these situations, and your tires blows out at the worst possible moment! This happened to me a few days ago. I was out to run some errands at 8 in the morning. I felt that it was getting difficult to pick up speed and negotiate turns. I felt something was not right, but did not exactly know what, so I looked down and checked my front tire. It was OK. After trying for a few more minutes I stopped and checked my rear tire. I had a flat. Darn it! As incredulous as it may seem, I was stranded near the carnival area with no repair shops nearby, and I had no cell phone on me. It was so early in the morning and I've planned to be out for 15 minutes, tops, I had left my cell phone at home. Stuck so far away from home, with no way to call for help, I weighed my available options, there were none! 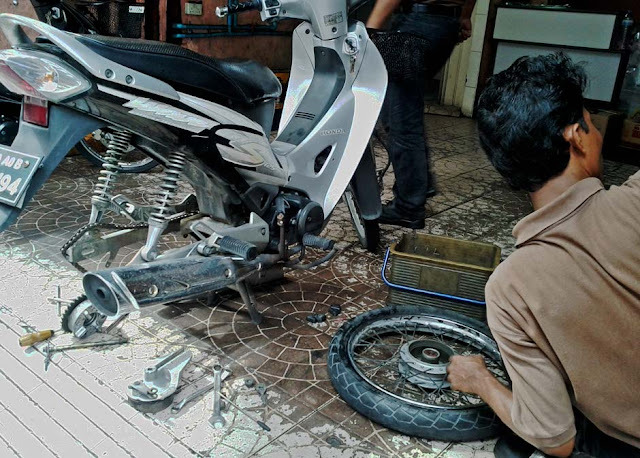 So, with the rising sun behind my neck, I started to push my bike to the closest place I knew, a row of repair shops on a narrow lane behind ADK Hospital. I was kind of relieved it was not the front tire that blew out, that would have made it more pushing the bike more daunting a task, may be even a bit treacherous. Anyway, I made to the shop in about 15 to 20 minutes, and as luck would have it, it was too early in the morning, and all of the shops were closed. I asked around and found out that they opened around 9:30. I thought against waiting there for more than an hour, so I parked my bike, and walked home. Later that morning, I took the bus, went to the repair shop, and had my bike fixed in less than 20 minutes. Cost me MRF 145/-. Apparently, they don't do patching anymore, they just replace the inner tubes. So, it got me thinking, wouldn't it be nice if we had a number to call in situations like these. Something like a towing, bike repair, road assistance service? Wouldn't that be great? I don't know if a service like this exist in Malé, but I do know that this service is available in Addu and Fuah Mulak. I have used the service myself in Addu a few years ago, when I some how managed to puncture my tire riding on the famous Link Road. I called a number advertised all over town and two guys came on a motorbike with all the necessary tools. I had my tire patched up and my bike ready to go in less than half hour. I think that time it cost me MRF 25/-. If this service is available in Addu and Fuah Mulak (and probably other atolls) I wonder why it is not available in Malé, with more vehicles on our roads, and seemingly more hazards on our roadways? Also, how about an insurance policy to cover unfortunate incidents and unplanned expenses like these? I'd definitely buy such insurance! Wouldn't you? Bro, Fuvahmulah is a city way better than Male' with more services available to its residents. Also, its advisable to check your tires before you take your bike on to the streets of Male'. i have seen mobile services for motor bikes from Addu City and Fuvahmulah. So they do have this service ... Laamu is a big atoll too ... I think they might have this service as well, eh ?? ?